Successfully Added Bluetooth DVR Clip-On Surveillance Set + Media Player (2GB) to your Shopping Cart. Hands free communication and ing, feel like a real agent with this Bluetooth clip-on DVR Set. With the secretly built in camera for video capture, simply record your desired videos openly, and no one will ever know their being filmed. You've seen our Bluetooth style DVR and image capture clip-on surveillance device. Well, we now present the next generation in video surveillance with an active Bluetooth function for hands free calling. The I31 comes with a Bluetooth earpiece that has a 3.7mm pinhole lens built into it discreetly, and a separate receiver with a 2.5 inch LCD screen to watch what you are capturing. The DVR receiver also comes with an internal music and video player. So not only can you watch your captured footage, you can also listen to your MP3 music files, and even watch MP4 videos as well. This CVLF-I31 looks like a fashionable clip-on Bluetooth earpiece just as you would expect from the big brand names such as Sony, Motorola and the likes. Durably built and comes in a light weight body design made of hard molded plastic. This fashionable Bluetooth device provides you with a whole new surveillance technique. Think about it for a sec, your using your Bluetooth device for hands free calling, you see something you like, well then, just press record and start filming. The DVR Bluetooth set is perfect for those days when out and about, walking in town centers, shopping, capturing secret footage when traveling, such as border crossing, airports, ferry terminals, you can pretty much film anywhere that doesn’t allowed filing. The CVLF-I31 is the perfect investigative surveillance DVR gadget, just you clip it on and go about your normal day. When you see something interesting or suddenly find your self in a situation that you simply must capture on film, then you will be happy to have this great gadget with you at the time. Whatever the occasion may be, filming is not always permitted in most areas, and when people know they are being filmed, they control their actions and are careful of what they talk about. The CVKA-G146 is perfect for law enforcement professionals or private investigators. The CVLF-I31 is a great surveillance image and video capture device for both professionals or people who simply wish to play secrete agent. Proudly brought to you by leader in and surveillance electronic gadgets, Chinavasion. Charge Type: Via wall charger or USB connectivity to your laptop computer. You can record up to 1 hour of video footage per full battery charge. Depending on usage, it is best to fully charge and then fully drain the CVLF-I31 internal battery for better battery life performance. Can this unit also take photos? Who needs photos when you can shoot videos. 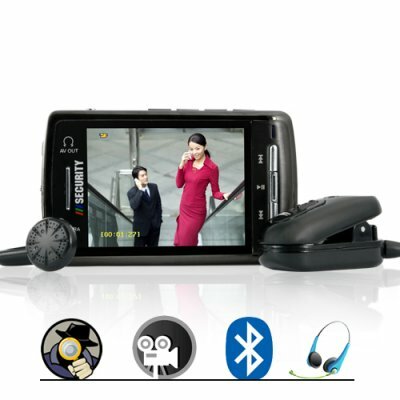 This unit is designed primarily for Bluetooth paring with your cellphone, and capturing video footage. The MP3 and MP4 feature are built in to keep you entertained when not filming.